Looking to promote dialogue with other countries, the Government of Brazil aimed to use Expo 1970 to restore Brazilian influence and promote its particular style. Favouring a ‘Brazilian approach’ to architecture while respecting budget and time constraints – and with only 25 days to submit proposals – the Institute of Brazilian Architects was unanimous in selecting Mendes da Rocha’s unique pavilion design. 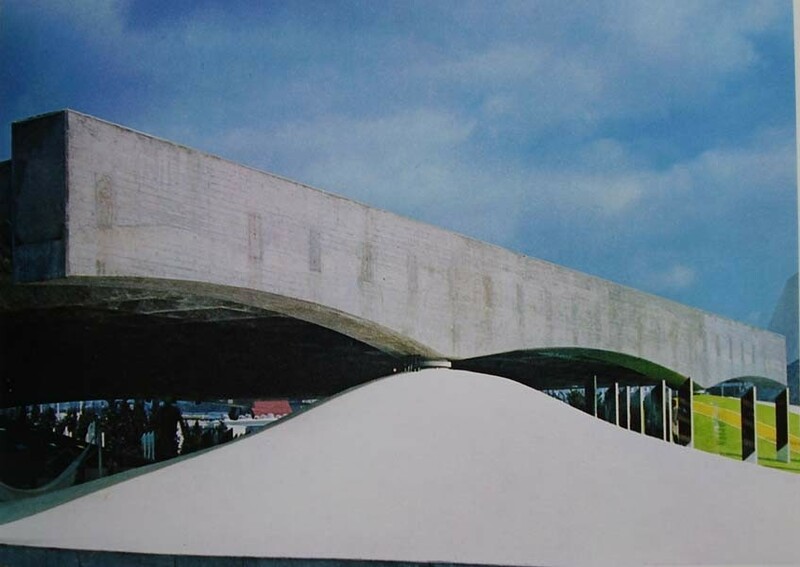 Notable for its “desirable sign of modesty”, the pavilion was composed of a large, geometrical concrete roof delicately poised atop an undulating landscape. The discretion of the structure led it being dubbed a ‘non-pavilion’, underlining the architect’s aim to focus design on the relationship with the site, rather than on the pavilion itself. Despite its popularity during the Expo, the pavilion was removed after closing. It nevertheless remains an icon of Brutalism, shaping the Brazilian architectural tradition and being the first of several celebrated creations by Mendes da Rocha, whose achievements led to him being awarded the Pritzker Prize in 2006.